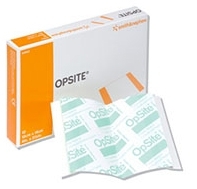 OPSITE Transparent Waterproof Film Dressing from Smith & Nephew is a transparent, adhesive film. The film is moisture vapor permeable, conformable and extensible. It is widely used to provide a moist wound environment for superficial wounds; it is also ideal for use as a secondary dressing. It features a superior film with acrylic adhesive and waterproof film. -Superficial wounds, such as shallow pressure sores, minor burns, cuts and abrasions. -Hydrogel Dressing or ALLEVYN Cavity Wound Dressing. -The patient should be receiving suitable systemic treatment. -Immuno-compromised patients and diabetic patients may require extra supervision. Care should be taken to avoid skin damage by repeated applications on patients with thin or fragile skin.